Good morning! Our January is feeling more like May here in San Jose, temperatures in the 60's all week, and while I do live in California, this is still a bit odd for us this time of year. We had rain, but now no rain on the horizon, which is something we need in our dry state. Now, onto the dreaded topic for today: Organization. Some of you have rather large areas, some have small areas (like me) and some crafters have to haul their tools out and craft on kitchen and dinning room tables. Whatever your situation, today I should have a link or two that will hopefully give you some inspiration to organize your tools/papers and whatnots. First and foremost, given that we are still at the start of the year, one of the best ways to organize yourself is to clean out what you haven't used: old stamps, paper, tools, inks, whatever it is that you know you haven't used in the last year or two, now is the time to clear it out. You can donate your old crafting supplies to local schools, you can give your old supplies to a friend who is just starting to paper craft or you can try to sell some of your things on places like ebay. Whatever your choice, the objective is to remove that which you haven't used and know deep down in your heart you aren't going to use. Once you have cleared out your stash, the next step is to determine what it is that most needs your attention. In my case it is punch storage, in your case it might be paper, stamps, embellishments or other tools. After you get your worst mess together, move onto your other supplies, and little by little you will find that instead of spending half your time looking for something, you will spend more time crafting! Club CK: A whole group of links here for you to visit, and I am sure you are going to find something on one of these posts to inspire you to organize your stash. Ribbon Organization: Great link with some good ideas, and check out the links at the bottom of the article for more ideas on getting everything organized. Picture Organizing: Nice article on how to organize all of your old pictures and actually get them from the computer into a scrapbook. Organization blog: WOW! This blog is devoted to organization for scrapbookers/cardmakers/papercrafters, and it has tons of great images and ideas for you to view, loved it! 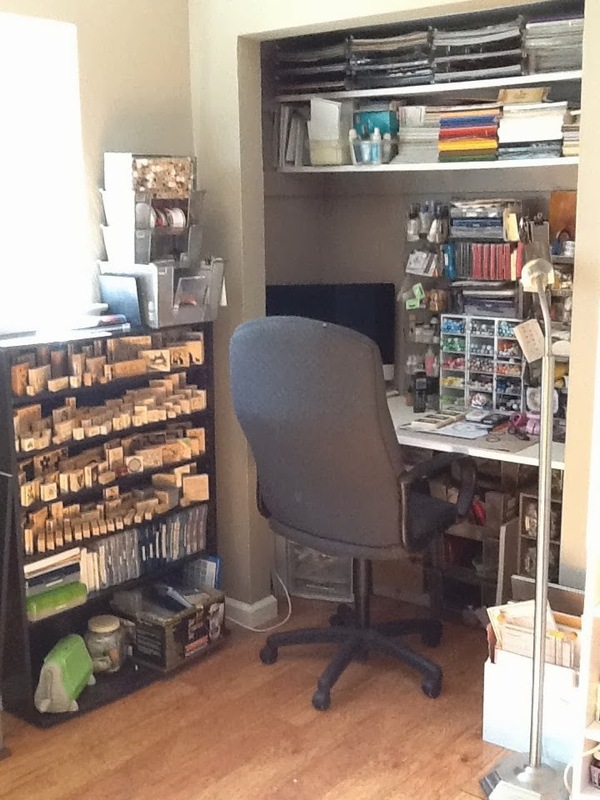 Organizing Craft Rooms: A video is posted here and then another group of links at the bottom of the post for more organizational blogs/posts. This Blessed Nest: Part one is the link on the left, and here is part two, you are going to love what she did with her space and will get some great ideas as well. The Frugal Crafter: Nice video of an organized craft room and then lots of tips to help you get organized. Don't forget to check out the free digital images on her blog as well. Cropper Hopper: Lots of great ideas here, many of them work in both large and small areas. Ok, that is all for this week, next week will be filled with all sorts of goings on at CHA, can't wait to see what goodies are unveiled for us there!